This tree blooms twice a year. We love it. We want more. Today I looked out over the orchard at it and realized we had a spitting image of a Truffula Tree from Dr. Seuss’s The Lorax in our back yard. Now I love it even more. And I certainly won’t ever think of cutting it, lest a little moustached fellow pop out to teach me the error of my ways. Ah, I love the purple pom-poms! Do you know if it’s native or some exotic? I haven’t seen anything like it around Rio. I have no idea. My husband thinks they’re imported from Colombia? Or maybe they’re a type of jacaranda (which would make them native to Brazil)? In this region you see them here and there (they’re showy enough that you can notice them from a distance). Now that I think about it, they’re usually not in the middle of a forest, and more likely to be near a habited area which makes me think they’re imported. Give me a few days and I’ll ask one of the farm guys who knows the name of all the trees. 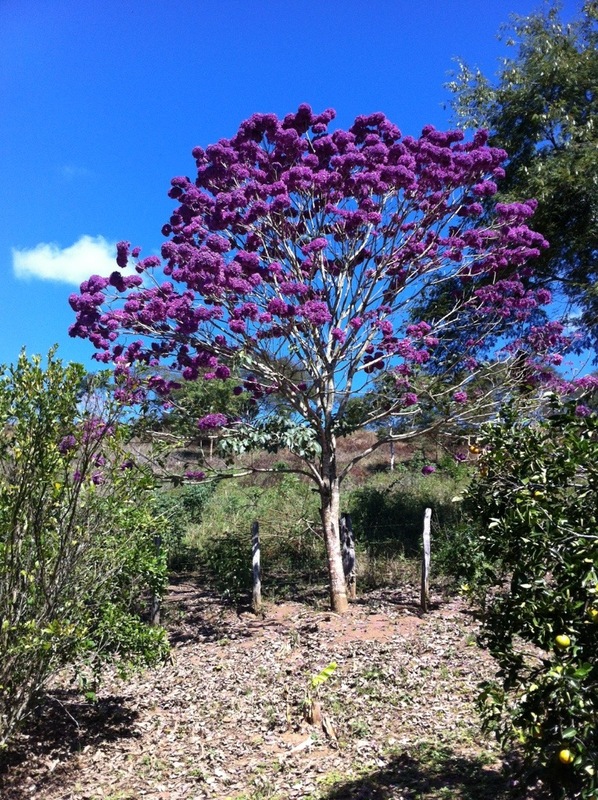 I love the blossoming trees in Brazil, especially the bright reds, purples, and pinks. I am getting ready to make a big purchase of blossoming trees and plants to help with the landscaping of my farm! I’ll keep an eye out for the pink flowers and if I find the name I will let you know!